November | 2017 | Back Off, Bacteria! Ever noticed productivity goes up when it’s easy? Productivity, productivity, how staff must hate that word. Working longer, working harder, always going the extra mile. No easy way out. Faster, faster! Seems there’s no escape from having to work MORE, just to stay in the same place. Yeah sure, not so bad if there’s extra money and longer holidays up for grabs. Though neither can lessen the pain. All those hours lost, families fragmented, personal life down the tubes – where’s the magic? Carrot and stick, see? Working late like everybody else does. Because that’s what it takes to still have a job. Nobody WANTS to slave. But everybody HAS to. With brooding resentment every step of the way. Which is one hell of a way to run a railroad – or anything else for that matter. Nineteenth Century sweatshop thinking. Head-on into everything and coming unstuck. Much simpler to go with the flow. Bending with challenges and shaping around them. Making them work FOR you and not AGAINST. Working harder by taking it easy. Advanced technology and AI (Artificial Intelligence), for instance. Finishing in seconds where us humans take days or weeks. Fast, yes – but not necessarily smart. Great for industry and automated business. Not so hot in the real world, where the business is satisfying people. Customers of course – and those amazing people called staff. The ones who make it all happen. The very same who are always working those extra hours. And what do they get for it? Tired, worn-out, nervous, irritable and depressed. Unwell of course with it, but unable to stay away. Jobs are few, nobody gets paid sick leave, and there might not even be a job to come back to afterwards. Exactly why British productivity is down the tubes. The productivity puzzle they call it, though a solution is within reach – just by taking it easy. Experts agree the puzzle started in 2008, with the financial crash. Redundancies, cutbacks, firms going belly up – kind of inevitable productivity took a dip. But surprise, surprise, absenteeism took a dip too. With jobs thin on the ground, it was not the time to stay away from work if you were sick. Ten to one if you did, there’d be a junior in your place at half the salary. Bargain basement work quality, but money was tight. Check the records. From 163.2 million days lost in 2007 just before the recession, absenteeism plunged 20% to 132.4 million days lost in 2011 – with only marginal recovery since. Loud warning bells, right there. People don’t suddenly stop getting sick. And germs don’t suddenly stop attacking us – after four billion years as the most successful life forms, they’ve learned to never give up. Reality check: in the whole history of the world, there’s never been such a thing as a get-well epidemic. So if they didn’t take off sick, what were these people doing? Going to work unwell, of course. Toughing it out and pretending they were OK. And reality check again: hiding it as best they could from colleagues and employers. Whatever their numbers look like, the true picture is far worse. And the truth is that since 2008, presenteeism – that’s people unwell at work – has increased steadily. There are no official figures, as the issue is largely invisible. But with the all-pervasive culture of long hours now firmly established, it’s not unreasonable to suggest they’ve doubled. And productivity in the meantime? Down 15% on other G7 countries. 27% less than the Germans and 31% less than the French. Hence the Euro-joke that it takes the Brits an extra day to do a week’s work. Well, yes. For so many of us, it’s doing the job with one hand tied behind our backs. Exactly what it’s like trying to work when you’re not well. Hard to focus when your body’s out of balance. Just keeping your mind on the job becomes a mission. Mistakes get made, deadlines get missed, business flies out the window. Get really unlucky, and the whole company could crash. OK, so in easy steps, how do we turn things around? Prevention is better than cure – remember that one? Eliminate germs that cause illness, and the problem turns around. Because make no mistake, the germs are there – in their billions, just like normal. Too small to see so they’re not on our radar – but we are certainly on theirs. And because we not aware of them, we leave ourselves wide open to attack, particularly in the workplace. Again, because we can’t see germs, our personal hygiene is not much better. Getting rid of germs therefore is like saving us from ourselves. And it’s easier than we might think. A nightly mist-up with ionised hydrogen peroxide takes out ALL germs in the air and across all surfaces to make the place sterile. As simple as pressing a button, it makes workplaces safe and secure for around £30 a day – probably less than the existing office cleaning bill. It’s a proactive step too. More positive than pretty well all staff wellness programmes. In their excellent Absence Management report, the CIPD list TWO PAGES of popular wellbeing options – from counselling, to gym membership, to healthcare packages – but not one addresses health protection. But if there’s no germs, there are no illnesses to catch. A big impact from any staff point of view. Effectively demonstrating with actions not words that management is concerned for their welfare. That keeping them well and healthy is a top-level priority, and a major gesture at encouraging engagement. How’s that for effective motivation and retention? A major boost to work quality too – without any demands on staff commitment. No longer hours to work, no extra mile to go, staff can give fully of themselves without being impeded by health issues. So, with the ball rolling – and a boost to staff output capability now climbing by up to a third – productivity should be well on the upswing. Continuing staff engagement maintains this momentum. Dialogue to gain their involvement, listening sessions to ease their anguish. The easy but crucial step, from old-style Us & Them conflict, to useful two-way partnership. Involvement, yes – because Beryl from Accounts knows more about VLookups in Excel than the IT consultant about to commit thousands on yet another system upgrade. The consultant might never touch Excel, but Beryl uses it daily. And anguish, because everybody feels some – which could be stress, emotional strain, relationship issues or financial worries. Except a problem shared is a problem halved, especially if the boss is sympathetic – an engagement landmark and another notch up for recovering productivity. See? All of them easy steps, all of them key to everyone working better, enjoying what they do, feeling mutual respect and sharing their commitment to get on with the job. A quantum leap from the Dark Ages of harder, faster, stronger. So easy does it. Smarter, friendlier, healthier. Productivity up and on the road again. OK, so we’re lagging behind if you believe the Office for Budget Responsibility. Not keeping up, hanging onto our shekels, not investing in the future. Doesn’t look like it with the new start-ups making the headlines. New ideas, new technology, the front-runners are showing the world. Across the board though, there’s no doubt performance could be better. Bigger, more established businesses are not so quick to jump in the gaps – and too many cut corners with low income immigrant labour. They might look like they’re trying to go places, but the fact is that pretty well all of them are standing on the brake. Holding back, without even knowing they’re doing it. But as winter draws in and the days get colder, the evidence becomes more obvious. The first sneeze, the first sore throat, the first coughing attack in the office. A team member gamely pushing themselves at their desk, determined not to give in to whatever bug it is – common cold, H3N2 Aussie flu virus, MERS, SARS, or any one of a billion possible illnesses. And that’s the clue – being unwell at work. Trying to keep going, but feeling like death warmed up – at what kind of capability level? 60% of their normal? 40%? 25%? Under-powered performance and under-powered concentration. So the work load suffers and accuracy with it. Lots of good intentions, but unwell staff are unable to deliver their best – which means productivity can only take a dive. And how long will it be before other team members start coughing too? Everyone sharing the same work space, breathing the same air, touching the same things – it’s going to happen isn’t it? What goes around, comes around – a setback is almost inevitable. Which is what we mean by standing on the brake. Because what do most businesses do about protecting staff from colds and flu – or anything else for that matter? A company flu jab, maybe – and that’s your lot. It’s winter – so expectations are high for norovirus, the vomiting bug, to appear. What measures are taken against that? Or legionnaire’s disease, a pneumonia-like killer that spreads through the air via the HVAC system? Neglect that one and it can cost millions in health and safety fines, as G4S Cash Solutions found out. What about duty of care? Also on top of the health risk, other hazards like mould and damp can trigger a £5K spot fine. Or as one charity found out, £12,000 in compensation and six months of expensive renovations. That’s in addition to the 30 other notifiable diseases listed by Public Health England – along with 60 notifiable organisms that present a significant risk to human health. 90 illnesses any business is liable for if found negligent in duty of care. All of which are expensive oversights to make. But a drop in the ocean compared to on-going unwell-at-work costs and the impact of under-performance on productivity. Because unlike time off for sick leave, which for most people is just 6 days a year according to the CIPD – being unwell at work is likely to be 10 times that at 57.5 days a year, almost three working months. Three working months of under-powered performance. And that’s for EVERY team member – from the lowliest apprentice to the top-ranking CEO – because we’re all human. No wonder productivity is less than it could be! Sure, we’re exposed to germs all the time, so some of them may have come from outside. Reality is though that we spend 90% of our time indoor, particularly in winter – and most of our waking hours are spent at work. So it’s no surprise our workplace is where we’re exposed the most. There’s another dimension too. Germs are so tiny, they’re airborne most of the time. And around 80% of any room space we work in is air. We might clean our workplace thoroughly, scrub every surface within an inch of its life, but there’s no way to scrub the air. And in a study prepared for the Wall Street Journal, germs were found to spread from the front door handle to more than half the office in less than four hours. Uh huh, the air. We share it, we breathe it, we move through it – and all the time we’re immersed in germs, surrounded by them, constantly in contact. Sometimes we fall victim, sometimes we’re lucky. We get something and throw it off quickly, or it has us seriously out of action for several days. We’re at constant hazard, yet how many businesses provide protection against it? Surprisingly, nobody thinks about it, accepting getting unwell as a fact of life. Productivity with the brake on, even when money and technology are trying to accelerate it. Yet releasing the brake is easy. Mist the place up with an effective biocide like ionised hydrogen peroxide, and ALL germs are eliminated in under an hour depending on room size. Throughout the air space, across all surfaces, and into all the nooks and crannies too. And with no germs to catch, there are no illnesses to fall victim to. Those three lost working months are restored, with team members able to perform at full capacity all the time – 33% more than they could previously. The brake is well and truly off – there’s nothing to hold back from a rapidly brightening future. Full throttle – look out world! Looming larger than ever with the impending Budget and Brexit, Britain’s productivity illness is not going away soon. It is significant that our present productivity handicap is referred to as an illness – and in the same breath something to accelerate out of, usually by throwing money at it. Prevent illness, or make super-well? Quite how to accelerate with an illness is not explained. Even top performers like Jessica Ennis–Hill are unlikely to surge ahead in the grip of a common cold or flu. But illness is right, and in a word explains what is wrong with our productivity. It’s less than it should be. Not surprising when you consider our track record of workplace performance. Three years ago, business experts PwC calculated the national cost of absences due to illness at £29 billion a year. A figure that assumed an average of 6 days off sick for every earner in the country. But it pales into insignificance alongside the cost of presenteeism or being unwell at work – calculated in a GCC report (now Virgin Pulse) at 10 times absenteeism or £290 billion. Together that’s £319 billion, substantially more than any of the figures promised by government to boost R&D of super-performers in the high-tech/AI sector – side-stepping and ignoring also-rans like retail and hospitality. £319 billion on illness. Isn’t it worth doing something about fixing that – instead of chasing pie in the sky dreams? Mind you, it’s not surprising that such illness is associated with work. Look around, and our workplace standards of protection against germs are truly frightening. Small wonder that on average we’re each of us feeling less than ourselves at work for 57.5 days a year, or nearly three working months. Or closer to home, we all have some kind of ailment giving us grief roughly every three days. And yes, they’re ill all right. Because we can’t see germs, we don’t think we’re dirty. And alongside sloppy hygiene in the workplace, our personal standards are even worse. All of which means we’re sitting at our desks waiting for illness to happen. And what is the quality of work we’re capable of, feeling like that? Some bug we picked up at the office does our head in so we’re not able to concentrate. Which means it’s done wrong and has to be done again. Or done wrong and not picked up, to let the fox loose among the chickens later on down the line. Three working months we’re out of it. Which means for every twelve months we get paid, we’re only delivering nine. That’s productivity illness all right. And why retail and hospitality bear the brunt. Higher exposure to other people, more physical interchange and contact with commonly touched objects. More germs. Get rid of the germs and our productivity illness goes away. It might still be less than it should – but at least it won’t be held back. And three months of our salaries won’t be going to waste paying for us to be out of it. Better still, get rid of the germs before we’re exposed to them. And more easily achievable than we might ever imagine. For starters, what health protection if any is in most workplaces right now? A nightly hit teams comes in and vacuums the floors, empties the rubbish bins and wipes down the desks with a damp rag. And that’s your lot! Now look down the back of your computer or under the keyboard. Hold your phone up to the light and look at the touchscreen. Dust bunnies and crumbs. Smears and finger marks. Leftover detritus from chicken tikka marsala, birthday cake, biscuit crumbs and dirt off laptops picked up off the floor in the Underground. And all of it untouched since your organisation moved into the building five years ago. Start off with putting antibacterial wipes or gel on every desk first thing in the morning. Not so easy to forget washing hands when there’s an alternative right in your face. Well, not quite as drastic as that – and a lot safer. Actually to sterilise the place, mist it up with a mild but effective germ-killing biocide that spreads everywhere – through the air, across every surface, into every nook and cranny, you name it. Result, no germs – no illnesses for anyone to catch. No more underperforming feeling like death. Twelve months’ productivity instead of nine – UP BY A THIRD. Do that every day and productivity illness becomes a thing of the past. So things take one day longer each week to do in Britain than in other G7 countries? Up by a third means six days are now four. One day LESS to do in Britain than in other G7 countries. How about it, all you business eggheads? Up for a little prevention not cure? Come on people, there’s £319 billion in it for you. £30 a day to save you thousands – can you afford not to consider it? Don’t believe all the City doom and gloom, it’s a lot easier to turn productivity around than you think. Oh sure, UK productivity lags behind the major economies. But there’s a reason for our stunted performance – a penalty we all pay without realising it. Because it’s not that we’re less productive. More that we’re not actually productive ALL of the time. Far from it. In fact, without our knowledge, something is holding us back for almost three working months every year. 57.5 days on average. The price we pay in lost productivity by coming to work unwell. And right there is the shortfall. For every 12 months of salary paid out, the best we Brits can deliver most of the time is only 9 months worth of work at full capability. In the missing 3 months we’re gobbling down tablets to ease crippling back ache or muscle pain. Trying to ignore the near-fever of flu or norovirus that turns our guts to jelly and our minds to boiled knitting. Or grappling with monsters of worry or dread, sometimes bursting into tears with the stress of it all – men as well as women. “Presenteeism” the HR people call it. When we’re smitten with unwellness that saps our skills and ability to think – but no so bad that we have to take time off for it. Or perhaps we’re so worried about job security, we come to work anyway. Not wanting to get fired, feeling like death, with a dread of being found wanting. Three months of the year, we’re like that. Every one of us, the top brass too. At work and battling with some kind of physical or mental issue every three days or so. Think of how an ordinary cold drags on for days and weeks. Hardly worth pulling a sickie, but slowing us down in ways that could unknowingly hurt our job. Like staying fully focused when attention to detail is critical – reviewing figures for a bid, or brainstorming a new strategy – and then getting them wrong. Same thing with mental challenges – a death in the family or worrying about finances. We’re not actually ill, but emotional and psychological pressures can drive us into it. Giving ourselves ulcers is all too familiar – so is the lost feeling at the edge of a breakdown. Because we’re not machines, we’re human. Our lives go up and down – happy times, tragedies, unexpected illnesses, accidents – and just to be at our desks can be an effort, let alone deliver 100%. Which is why on balance, most of us are only capable of 75%. So how do we turn it around? Not by grabbing for the latest business must-have. Even with the latest technology, our own performance would still be less than we’d like. 75% of the advanced version is still only 75%. Better deal with the issues that stunted us in the first place. If we really want to turn productivity around, delivering 100% of ourselves has got to be the goal. Start with the quick fix, clobbering whatever it is that make us ill.
Germs, of course – a no-brainer. We can’t see germs, they’re too microscopically small. So we don’t even think of them. Reality is that they’re around us all the time, we’re even half bacteria ourselves. On top of which, every one of us carries our own personal germ cloud floating in the air around us – our own bio-signature, as unique as a fingerprint or retina scan. Nowhere is probably more laden with germs than our own workplace. Just lift your keyboard and look underneath. All those dust bunnies and detritus are the things we CAN see – so just imagine the germs that we can’t. You get the picture. No matter how clean and tidy your workplace might be, chances are inevitable it’s crawling with germs. An increasing aggregate of germs too. If the place has never been treated, it’s likely bacteria, viruses and fungi have been breeding there since the year dot. This is where the £30 comes in. The business end of how you turn productivity around. And probably not much more than you’re already paying for your daily cleaning service. That’s all it takes to get yourself a whole health protection system to eliminate all germs. And you read that right – ALL GERMS. Cutting to the chase, your £30 a day buys you the whole kit and caboodle to do it. Germ-killing biocide, dispersing machine, accessories, training to use it, finance to acquire it – and the only insurance policy of its kind in the world to cover your use of it. You put the machine into action every night when your team are gone. When it releases an ultra fine mist of ionised hydrogen peroxide that reaches everywhere and oxidises all germs to oblivion. To a 6-Log Sterility Assurance Level. OK, so you can’t protect your team from picking up germs outside. But in the workplace – the space they all share, work in, move around in, breathe in and generate money in – the entire surroundings are sterile. No germs to catch, no illness to succumb to, no under-performing at 75%. Your team feel healthy and good with it, the first step to turn productivity around. So what has it brought you? More bang for your buck in the salaries that you pay people. Still the same wages, but more of your money’s worth. Closer to full power performance. Un-stunted by illness, the same people can do their jobs better, faster, with fewer delays. Which gives you time to apply in your next step to turn productivity around, alleviating stress. Let’s face it, if any of your team were your son or daughter, you would be sympathetic to the pressures they were under – and indulgent with how you handled them. Feelings are sensitive things, and can make or break the strongest relationships. Because your team are human, just like your kids are. They need sympathy and indulgence too – or better still, compassion. If you value them, they need to know they are not machines. So you give them time. And you can afford to. You’ve just won a whole load back by getting rid of germs, now spend it wisely to de-stress your team. Come to that, it’s time that can de-stress a lot of things. Take the accepted Twenty-First Century culture we have drifted into of always-on involvement. A stress-maker if ever there was one. Team members feeling pressured that they never get time to disengage. On edge always to check their emails far into the evening and weekends. And only a skip from there, working hours late at the office like everybody else. Having to prove commitment over and over again. No wonder they get sleepless nights. And no wonder their energy flags when they’re back on deck in the morning. Take a walk round the office at 5.30 and see who’s there. Ask what’s wrong and how you can help. Well there must be something wrong if they’re still there after hours. Isn’t the work designed to be accomplished in the time allocated? So what glitch has happened to make them work late? Besides, your team need their own time to recharge and revitalise for you. To go home and engage with their own lives, so they’re ready, fresh and motivated for you in the morning. Likewise weekends and public holidays. Make them take them, it’s to your advantage and takes the pressure away. Relationships to sort out – people being side-lined by cliques, disagreements with a line manager’s protégé, defusing favouritism, even coping with bullying. Yes, they all take time to discuss and resolve. But time is a substance you can afford with healthier staff – and it’s not the work that’s important, it’s the people who enable it to happen successfully. People issues SHOULD come first. So you CAN take time out to consult and discuss. You CAN afford to listen. You CAN take time to show that you care, that you value your people and WANT them to work for you. Just as, by handling them right, you persuade them that they WANT to work for you. And how much stress could that ease? You may not come to work every morning on the 7.25 to Waterloo. But it would be useful if you did. Jammed in tight as always, you’re surrounded by shapes with the saddest body language in the country. Sagging, tired and exhausted before they’ve even started, there’s no motivation, these are people who resent going to work. They are angry, bitter, scared, brow-beaten, already impatient for the day to be over. Nobody has invested enough time in their aspirations to make them WANT to be there. What stress will they go through? What will they do to compensate? Some will pull sickies. Some will get drunk every night. All of them will clock-watch. All of them will be so stressed they’ll moan like a drain to anyone who will listen. With good reason. Nobody TOOK THE TIME to show they cared. There’s more you can do with time too – like you would with your son or daughter. Allow team members time off when they DO feel ill, poor work could be more damaging than none. Time off too when other issues crowd out their ability to concentrate. To see the bank about a loan, get a pregnancy check, sort out child care, go to a funeral, or get ready for a wedding. You care, they pay it back – in effort. Time is the pressure that stampedes stress, but with a healthy team you’ve got plenty of it. Fewer absences at home, fewer absences staring at their desks– and anyway productivity is up, so reinvesting time can only pay dividends. Which works for the people in pain too – the ones with the killer back aches or the foot they can barely walk on. But they’re yours, and they’re good, and you need to show that you value them. So give them time like they’re most important people in the world. Which they are – human assets working for you. Give them time to get down the corridor to the conference room, time to see the specialist, time for their physiotherapy. To turn productivity around, it’s worth it. Why pay extra for them to do their job? Will they do it any better? And wouldn’t they rather have a raise anyway? Well according to the CIPD, absenteeism costs around £87 a day. And according to GCC (now Virgin Pulse), presenteeism costs 10 times more – around £5K per team member per year. Can any business afford to keep making losses like that? For £30 a day, you don’t have to. OK, so go to it. Amazing, but very possible. And for less than £30 a day. About what you’d pay for your Mrs Mop cleaning service. Probably less if you have a dozen or more staff – all those desks and floor space. Which makes this a productivity health hack most other CEOs would kill for. Especially if they knew how easy and inexpensive it was. Well, who wouldn’t want 33% MORE productivity without paying an arm and a leg? So simple the way it works too. Just by getting rid of germs. Not something that’s on your radar usually, is it? Or something that you think of doing. A why fix it if it ain’t broke sort of thing. And without pro-active prevention, the way it gets handled is re-active correction. If it’s handled at all. Because nobody’s ill right now, so the usual thing is do nothing. Which basically means if staff fall ill, that’s their problem. You’re sympathetic of course, but you just accept it. And so do they. Luck of the draw. Happens all the time, right? Some bug hits them, they go see the Doc, get put on meds, possibly need hospital. From your point of view, an HR asset out of action for a while. Or heroically toughing it out and coming in to work anyway. Committed, loyal, one of your star performers. But either way, costing a lot more than £30 a day. Surely it doesn’t cost anything at all? Oh yes, it does. And it’s money you lose every time. Either in hard cash or in lost productivity. For starters, if they’re absent, you’re losing around £87 a day – more than double the £30 a day we’re rabbiting on about. That’s not our figure, it’s the CIPD’s (Chartered Institute of Personnel Development). Not a consideration because you don’t pay sick leave? Better think again. That’s what they cost in taking up the slack while they’re gone. Other team members on extra hours, delay penalties, temp staff – sometimes a lot more than £87. Not a lot of money in the great scheme of things. No alarm bells, nothing to lose sleep over. So it winds up in whatever slush fund you’re running for eventualities – or more often, buried as petty cash. But that’s not where it ends. Because unwell team members coming in to work (presenteeism) cost 10 times more – £5,220. Why? Because being unwell at work occurs 10 times more than taking off sick – 57.5 days a year on average, almost 3 working months. And during that time your slick qualified professional is just a shadow of themselves, feeling grim as all hell and going through the motions. Chances are also high that if it’s anything contagious, other team members will go down with it too. Which is way worse than an HR asset out of action. At least if a staffer is off sick, you can arrange a substitute. But unwell-at-work is more like a machine with an intermittent fault – unreliable because you can’t tell when – or if – it’s functioning properly or not. And still – even though it’s costing money, you’re paying for 12 months’ productivity but only getting 9 – the usual procedure is to do nothing. The team member plods on, swallowing tablets every few hours and unable to think straight – management nods admiringly at such selfless commitment – and neither takes any action. Mistakes are made, costs incurred – and the only lead is external. By medical intervention AFTER the condition has asserted itself – not prevention BEFORE. All that money – invisible because it’s already assigned as salary – is lost to the world as underperforming productivity. Things take longer, get done wrong and have to be done again, or get missed out altogether. Not because the system needs upgrading, or new efficiencies need to be put in place – but because some poor unfortunate is not feeling well and unable to perform properly. The stable door is bolted, the horse is long gone – with no attempt to avoid the situation in the first place. Prevention is better than cure – yeah, right. And the whole system necessary to achieve effective prevention is already available off-the-shelf – at under £30 a day, lock, stock and barrel. Like we say, the same or less than you’re already paying for Mrs Mop. And stacked up against £87 per day, per team member – no contest. By misting up the place with germ-killing hydrogen peroxide. All germs are oxidised to nothing, there are no infections to catch – in around 40 minutes on average, your workplace is completely sterile. And there you have it. A healthy team, fully functioning productivity, healthy profits. Because instead of giving you only 9 months of effort, your team are now generating 12 months’ worth – a full 33% more. Worth £30 a day don’t you think? Got to be fraud, right? £319bn a year for ghost staff? Believe it or not, your organisation is already paying it, just like everybody else. Invisible too. You won’t see it in your books. But you’re paying alright. And no, it’s not fraud. Just the reality of productivity lost from staff being unwell. We’re kidding, right? No way it can be that high. Better sit down, this might come as a shock. First off, business experts PwC put the cost of annual absenteeism at £29 billion a year. That’s people off sick and out of action. Either with musculoskeletal problems – usually back and injury problems, or stress – emotional and mental issues, or infections caused by germs – anything from a heavy cold to full-blown life-threatening illnesses. A lot of money. But the mind-boggling figure is the cost of presenteeism – calculated in a GCC report (now Virgin Pulse) at 10 times the cost of absenteeism – a monumental £290 billion. To put that in perspective, that’s the cost of team members coming in to work unwell. Workaholics who can’t stay away, heroes not wanting to let colleagues down, people worried about job security, or any one of a thousand different reasons. Thing is though, they might be at their desks, but what quality of work are they capable of? We’ve all been there. How easy is to focus when your head is pounding or you keep running to the loo? You know you should be in bed, but you stagger in anyway, often doing yourself and the business more harm than good. According to the CIPD, most absentees are away for 6 days – at an average cost of £522 per team member. But presenteeism for staff unwell at work averages out at 57.5 days per team member – almost 3 working months, at a cost of £5,220. Actually, it’s usually more than that. Way more – easily running into thousands. Because people unwell at work make mistakes, miss deadlines because they can’t concentrate, get ratty with customers and colleagues at the risk of losing sales, and generally fumble around like rookies, far from the slick professionals you originally hired. Keep in mind too, that feeling off at work is seldom in continuous stretches. More likely in sporadic bursts – a day here, 2 days there, intermittent throughout the year. On average working out to some kind of “off-colour” experience every 3 days. Put absenteeism and presenteeism together and you get the £319 billion we were jumping up and down about earlier. So where do we come with our mumbo-jumbo about ghost staff? Your whole team were hired on 12 month salaries, but presenteeism cuts their productivity down to 9 months effectively. You read that right. You’re paying for 12 months, but you’re only getting 9. For every member of your team, yourself included, that’s 3 dead months you’re bankrolling. Which means for every 3 team members working 9 months, there’s the equivalent of a 4th that you’re paying for over the same 9 months. Only this person doesn’t exist – not on the payroll, not anywhere. Not doing any work either. OK, so working off the CIPD’s figures, if one person costs you £5,220 over 3 months, in the 9 months that they actually DO work, you’re stumping up £15,660. That’s how much productivity your money buys – on 20 days a working month, that’s 180 days worth in a year, not the 240 you actually thought you were getting. Uh, huh. So THREE team members working 9 months is £46,980 – that’s the productivity you’re getting. But you’re actually paying for TWELVE months, which is £62,640, you sign the cheques yourself. The other £15,660 goes to your not-so-friendly ghost . Productivity lost – all written off in your salaries account. Well what else can you call it? A cost of doing business? Do us a favour! If you knew up front you were only getting 9 months worth of productivity for every 12 you paid for, you wouldn’t have done the deal, would you? After all, you weren’t born yesterday. And what kind of a business person repeatedly closes deals for ONE THIRD more than they need to be? Yet that’s what ALL businesses pay. Because ask yourself, how many British businesses have plans to PREVENT staff becoming unwell? Oh, there’s plenty with health promotion programmes and keep fit classes. With stop smoking and lose weight packages too. But few if any to actually STOP PEOPLE GETTING SICK. To push hygiene as best practice, eliminate germs or protect staff from hazardous exposure. Sure, well you can’t see germs – they’re out of sight, out of mind. So it never crops up on the radar that your team could be at risk in an ordinary work environment on an ordinary working day. Which is how come the figures for being unwell at work are as horrendous as they are. 62% of men and 40% of women NEVER wash their hands after going to the toilet? 95% of people don’t even wash their hands properly? Only 12% of people wash their hands before eating? Or that in most business work environments:. 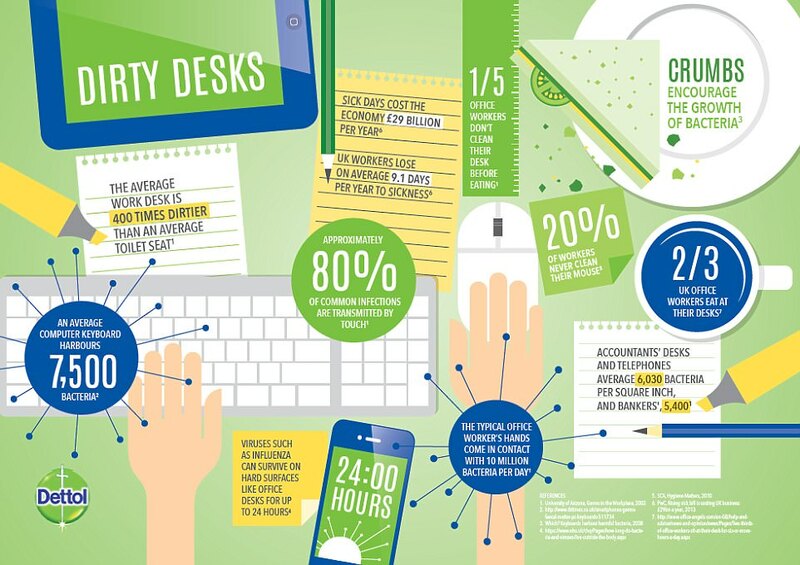 The average desk has over 10 million unseen bacteria – 400 times more than a toilet? A typical keyboard may have 7,500 organisms hiding on it? Only one in five of us ever cleans our desk before eating? At least two in three of us always eat lunch there? Which suggests that the average workplace is in reality a serious health disaster waiting to happen. Trying to get cover would be basically fraud. But even fraud never gets this calamitous. According to the CIPD, quoting the University of Portsmouth’s Centre for Counter Fraud Studies, the annual cost of fraud in the UK is £193 billion per year. Stack that up against the £319 billion in lost productivity through unnecessary illness – and it’s more than 1½ times as much again. Which sort of suggests something about duty of care and prevailing business acumen, doesn’t it? Except don’t beat yourself up about it. We’re all of us unaware of these issues – A) because we can’t see germs and B) because the cost is invisible anyway, all wrapped up and paid for in everybody’s salary package. Yet for only a few hundred a month – probably less than you’re already paying for nightly cleaning – it’s possible to eliminate ALL germs completely. Well at least as completely as 99.9999% – just 1 microorganism in a million. No viruses, no bacteria, no fungi – to a 6-Log Sterility Assurance Level. As sterile or better than most hospital operating theatres. As simply as misting the place up with germ-killing hydrogen peroxide after everybody’s gone home. The stuff reaches everywhere, grabs germs and oxidises them to nothing – 40 minutes and everything is sterile. No germs to catch, no illnesses to suffer, no productivity to lose, you’re back in the money. Not completely of course, there’s still the downside of musculoskeletal problems and stress to account for. Though if you’re a hot manager and show real care for your team, most of any stress issues can be minimised to niggles, so you’re still ahead of the game. Especially since you don’t believe in ghosts – or ghost staff for that matter. Our thanks to reader John Wright who recently treated us to an in-depth heads up on the sheer scale of worldwide obesity. Backed by some fierce number-crunching, John has created a report on Obesity Rankings by Country complete with an interactive map for at-a-glance perspective. His figures reinforce what we’ve been banging on about for ever. That in countries where food production reaches industrial proportions – factory farms and concentrated animal feeding operations – obesity is the highest. Fatter animals mean fatter us. Because residual antibiotics are present in everything we eat. If not from the animals, then from vegetables and plants fertilised by their manure. Exactly like them, we get low-dose antibiotics with every mouthful. And exactly like them, we bulk up. Without conscious control, our bodies crave energy-dense meals – the quick charge, fill-you-up satisfaction of so-called junk foods. Not actually junk at all, but concentrated nutrition in easy hand-held form. But food animals don’t live long. They bulk up quick and go to market. We bulk up quick and keep going. Getting fatter and fatter – and more and more unhealthy. Ten years down the line, diabetes, asthma, heart disease, cancer – we have a lot to look forward to. And the only way out of it – eat less. Go cold turkey. Stop eating energy-dense meals, or cut down on them. Choose foods that don’t contain antibiotics – almost impossible these days as everything in the supermarket has them. But if you have the will power, it is possible to slim down. Possible but not easy. Because dieting doesn’t work. Which comes back to John’s report. Because John’s organisation is all about bariatrics – the surgical way to get weight off. By gastric sleeve, gastric bypass, gastric balloon, duodenal switch or gastric banding . Expensive, but doable. And increasingly desirable, worldwide. Not because it makes you look slimmer, but because it could save your life. Obesity only goes one way. And diabetes, asthma, heart disease and cancer are all killer conditions. Unpleasant and painful. Slowly taking away self esteem, dignity, agility, mobility, strength, self sufficiency – and after much suffering, life. Want proof that it’s antibiotics doing all this worldwide? Take a look at John’s map again. At the places where obesity is the highest of all. Yes, predictably in advanced countries with mass food production systems – USA, Canada, UK and Australia. But through the roof in the Pacific paradise islands – Micronesia, the Marshalls, Nauru, Kimbati, Tuvalu, Samoa, Tonga, Niue – and highest of all, the Cook Islands. All places that not long ago were all subsistence cultures – living off the sea and tropical fruits. But now “developed” – with almost all food entirely imported. Food produced in the mass production countries – and laced through with antibiotics. A few months back we pointed out that being fat is not natural. That normally healthy bodies know what to eat and how much of it – and to stop when they’ve had enough. But antibiotics override all of that. Gimme high powered food now – more, more, more! Exactly the same as in the Arab countries. Once simple desert cultures – tough people, resilient and stick thin. Now oil-rich and sophisticated, increasingly bloated and fleshy – imported foodstuffs again, antibiotics in everything. Well, yes – we should. They’re starting to fail worldwide anyway – bacteria developing immunity from such massive overuse. Except what will keep us alive when we’re sick or need surgery? And what will keep the animals alive that feed us? For sure, antibiotics push production levels so high they’re the only way to sustain our 3 times population numbers on the same land area as we had 50 years ago. They also keep those animals alive. Because the living conditions are so intense, crowded and unhygienic, antibiotics are essential for their very survival. Take away the antibiotics and the animals all die. And we die too for nothing to eat. The only alternative is for us all to eat less. Forcing ourselves to cut down and stay that way – exactly like addicts coming off mainline drugs. John’s map represents an alternative worldwide. The bariatric option. Either way is sacrifice, but time is running out. Already two-thirds of us are overweight or obese and we’re eating ourselves to death. Thank you John. Now we know it’s time to do something. Only 0.0015mm long, it’s a devastating killer. Claiming the lives of 25 million people in the Middle Ages. Today it’s back – and already 120 are dead. Cut down in less than a day by a bug they breathed in. Black Death – otherwise known as The Plague. Right now it’s running riot in Toamasina and Antananarivo, both cities on the popular holiday island of Madagascar. It’s spread to the nearby Seychelles islands too – triggering alarm bells in neighbouring Reunion, Mauritius and Comoros. Also at risk are the mainland countries of Kenya, Ethiopia, Tanzania, Mozambique and South Africa – all of which have received alerts from the World Health Organization. And this time it’s not the bubonic version, which rode into Middle Ages Europe carried by fleas on the backs of rats. This is the more virulent and airborne pneumonic type, spread by coughs and sneezes and simply breathing in infected air. A plague outbreak in faraway Africa – the other end of the world. Can’t affect us here, can it? Nothing to worry about. All places a lot of Brits have just come from after the half term break. Possibly colleagues in the same office – or their friends. Sneezing and coughing like always after a long flight. Dried out sinuses, “aeroplane flu” or something more serious? Thing is, the pneumonic form of Yersinia pestis (as The Plague is properly known) comes on so fast you could be seriously ill by the time you’ve swallowed your first paracetamol. Yes, antibiotics can stop it – the Doc will probably put you on tetracycline or doxycycline and you should be OK. But until you’re isolated, you’re contagious. Breathing the same air as your colleagues – exposing them to the same 670-year-old killer that took out a third of the population of London. Not nice, the Middle Ages. And you don’t have to cough or sneeze to spread it. Every exhale is sucked up and swirled around by the office HVAC system – now cranked up as the days get colder, spreading to everyone. Don’t think that the system’s HEPA filter will take out the bug either. High Efficiency Particulate Air filters are only efficient down to 3 microns – and at 1.5 by 0.75 microns, Yersinia pestis is only half that. So if you’re one of those company heroes who insist on coming to work even though you’ve got a cold, you could be putting the whole office at risk. Even cause it to shut down before the end of the day tomorrow. Productivity zero. Just as it would be if the office came down with any other bug. Mild ones like colds and ordinary flu. Or serious threats like the Aussie A (H3N2) virus, MERS, SARS, e.coli – or any one of a thousand lethal hazards all the way to cholera and typhoid. Unless you deploy a defence. Send home anyone who looks suspect immediately – because all the symptoms look the same ion the early stages. Then protect the whole office from ALL germs altogether. Sterilising the office is the easiest way. Misting the place up after work with ionised hydrogen peroxide that reaches everywhere and oxidises all germs to nothing. Next morning, the whole place is sterile. No germs anywhere except what people bring in on their skin sand clothing. A germ-free clean sheet to start the day – with a 6-Log Sterility Assurance Level. Worth doing anyway on a nightly basis – we’re all of us off-colour with some minor bug or other every 3 days. And with so many of us working on top of each other all grouped together, the office is a sure place to pick them up. Off our phones, keyboards, light switches, door handles, and lift buttons – or simply from the documents we keep handing around. Plus on our desks and coffee cups – while we work through our lunch break. Chomping away on a chicken salad wrap, oblivious to the germs in the grit and dust bunnies we don’t always wipe off before we start noshing. A long way from the Middle Ages, yes. But with Twenty-First Century protection like hydrogen peroxide, we can afford to be. Our full 100% selves all of the time – not out of it 57.5 days a year like we usually are, sitting at our desks and struggling with yet another bug. Productivity plus – with the feelgood that goes with it. You can’t get much more efficient than that. Sick of the referendum? Or is it norovirus again? Staff illnesses cost us £319 BILLION a year – and our only protection is a flu jab?